Michael Collins (16 October 1890 – 22 August 1922) was an Irish leader, rebel and soldier. The guerrilla war of his Irish Volunteers during the Irish War of Independence, 1919-21 against British security forces was characterised by systematic assassinations and terrorism by both sides. He successfully negotiated independence from Britain in 1921, and was suppressing a dissident insurrection during the Irish Civil War when he was ambushed and killed. The Irish public romanticised "The Big Fellow" as a heroic gunman; he saw himself as a soldier; historians see Collins as a revolutionary strategist, spymaster and organiser, a highly energetic administrator, politician, and state-builder. Son of a farmer in County Cork, he was recruited into the Irish Republican Brotherhood, the secret rebel movement, at the age of 19. He became aide-de-camp to one of the leaders, Joseph Plunkett. During the Easter Rising of 1916, he was one of the occupiers of the General Post Office in Dublin. Following the surrender, he was imprisoned and narrowly escaped execution. During his internment in Wales, his leadership abilities became apparent and he soon became a member of the executive of Sinn Féin and a leader within the Irish Volunteers, soon renamed the "Irish Republican Army" or "I.R.A." By the start of the Irish War of Independence, Collins had become the most important leader of the I.R.A., but it was a decentralised organisation without a chain of command. His famed intelligence service had advance tips on the next moves planned by the British, and played a major role in the stalemating of the much larger British forces. 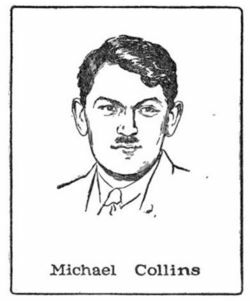 Collins had recruited informers in the Dublin police and especially its 'G' squad, who would telephone to tip him off when a raid was imminent; he had informants in the post office, the customs service, and even in government offices in London. The British government, pressured by King George V, decided to negotiate a settlement with Sinn Féin in 1921. By this point partition of Ireland had occurred and the state of Northern Ireland had been established as a constituent province of the United Kingdom. At the behest of Sinn Féin leader Éamon de Valera, Collins reluctantly led the delegation to the Anglo-Irish Treaty negotiations in London. The treaty was a compromise that accepted partition of Ireland (which Collins thought would be temporary) and membership in the British Commonwealth, which Collins considered a small matter. He endorsed the treaty and it was approved by the cabinet, the Dáil, and by the people in national elections. Regardless it was unacceptable to de Valera, who led the Irish Civil War to stop it. Collins was primarily responsible for drafting the constitution of the new Irish Free State, based on a commitment to democracy and rule by the majority. By April, 1922, the first shots were fired as de Valera organised the Irish Civil War to stop the treaty. Against this insurrection of so-called "Irregulars", comprising most of the I.R.A., Collins led the Irish Free State's Irish Army, called the "Regulars." Fighting for the pro-Treaty side, Collins hastily organised the new army from a minority of the I.R.A. along with new recruits; it was funded and supplied by the British government. When the Irregulars seized the "Four Courts" law buildings in Dublin in April, Collins waited until late June to counterattack. His move came shortly after his pro-treaty coalition defeated the anti-treaty coalition at national elections. The civil war was marked by anarchy and brute force, with unprecedented disorder, loss of life and destruction of property. Criminals used the confusion to rob and loot, as they attacked country houses and businesses. The damage greatly exceeded that of the war against the British. When Irregulars assassinated someone, the Regulars executed prisoners in reprisal. Women and children were used as decoys, women as gunmen; gunmen in mufti carried out ambushes and made attacks with pistols and grenades in crowded streets; as often as not the casualties were innocent passers-by. Collins was killed in an ambush in Béal na mBláth, County Cork, on 22nd August, 1922, but his much better organised army went on to defeat the poorly led insurgents, ending the civil war in 1923.